Tonight’s mission of the lightweight Vega launcher with three satellite passengers from French Guiana is on track, as the countdown continues for an 11:06:31 p.m. liftoff at the Spaceport. The 2-hour, 48-second flight will deploy the Proba-V, VNREDSat-1 and ESTCube-1 spacecraft on a mission profile that begins with the initial powered phase of Vega’s three solid propellant stages, followed by five burns of the AVUM bipropellant upper stage. 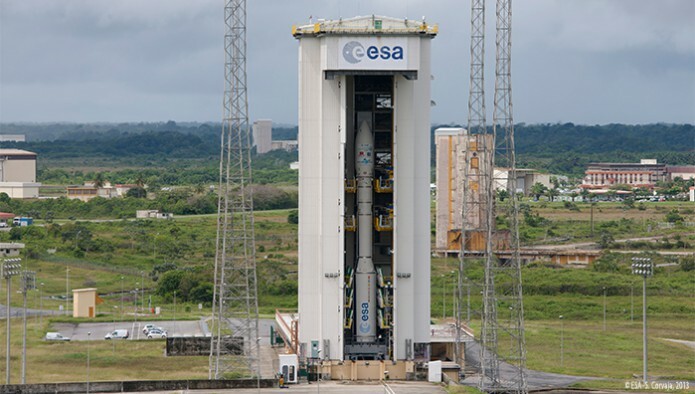 Vega is the latest member of Arianespace’s launcher family, which also includes the medium-lift Soyuz and heavyweight Ariane 5 – all operating side-by-side at the Spaceport. Tailored for launching smaller scientific, governmental and commercial payloads, Vega was developed in a multi-national European Space Agency program. Its prime contractor is Italy’s ELV joint venture of Avio and the Italian Space Agency. The nighttime mission with Proba-V, VNREDSat-1 and ESTCube-1 is designated VV02 in Arianespace’s flight numbering system, and will mark the start of ESA’s VERTA (Vega Research and Technology Accompaniment) program, which will demonstrate the light-lift vehicle’s flexibility and versatility. Vega’s maiden flight was performed from the Spaceport in February 2012, serving as the vehicle’s qualification mission.